Jessica Broad received her B.F.A. in ceramics from the Maryland Institute College of Art in 1996 and her M.F.A. from the University of Arizona in 2003. 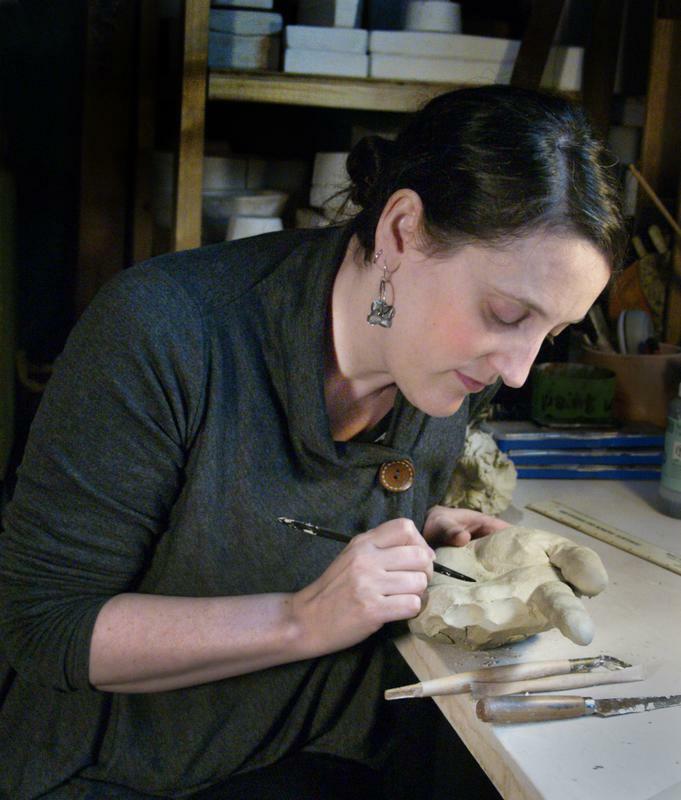 In 2005 Jessica received the Lormina Salter Fellowship at the Baltimore Clayworks. She was an emerging artist in the May 2006 issue of Ceramics Monthly. Her work has also been published in Lark books Image Transfer on Clay, 500 Raku, and 500 figures in Clay volume 2 as well as being featured in the gallery sections of American Craft and Clay Times. She received a Maryland State Arts Council Individual Artist Grant in 2006. Jessica has been a professor of ceramics since 2007. She currently teaches at the Savannah College of Art and Design. “I ardently believe in pretending. I council the young – and the old as well—not to say frankly what they are. I believe, deeply, in having all the pleasant make-believe we can build about ourselves. And I believe this because I know the imaginary person any of us presents must be a shield before oneself. The pretended image we offer is a mask put up naively in front of our faces—as old mimes in Greek plays held their masks of tragedy and comedy, beauty and splendor and shame, quite candidly before their faces, spectators looking on. The audience knew the player undertook his part and the mask fitted the part and that was all that was asked.” This is a quote from my great grandmother Elizabeth Gertrude Stern about personal identity and personal myths made in an article titled “Pretending” published in her book Not All Laughter (1937). This statement has resonated through the generations of my family, causing some great pain others intrigue. Made up family stories, embarrassments about the reality of our identity, and celebration of the oddities of our history, have been passed down from generation to generation, growing in mythical proportion with each retelling. I imagine many families have similar muddled lineages that frustrate and fascinate them. Since a large part of what we know about ourselves as people comes from our memories, things that remind us of our past often fascinate us. This is especially true of things that cause us to recollect our families and childhood. Quite often these “memories” are in fact personal myths that we create to give ourselves a sense of being connected to something larger than we are. In the case of my family these stories have come to span generations, in others they may only exist in the here and now. I make art that examines the relationship between memory, identity, and familial bonds. I look at how we perceive our past, and how the influences of our environment and society shape how we conceive ourselves. I use images from my personal history as allegorical stand-ins for my ideas about this process of self-delusion. Recently I have found my work to be diverging in two different directions, firstly towards my interest in family and memory, and secondly towards my fascination with natural forms. The two had been overlapping in previous work, but I find that I need to separate them now. Therefore, my current body of work revolves around a fascination with the microscopic, with the fragility of life, and the beauty found in parts of nature we tend to ignore. Through my family I have inherited interests in algology and mycology. I grew up exploring the seashores and forests of New England. I would spend hours studying the life in tide pools, or a tiny ecosystem with ferns, toads and fungi on the forest floor. These early predilections have translated themselves into my present interest in representing the unseen, uncelebrated world of microscopic life, the life that, while tiny and ephemeral, supports all other life on Earth. The two bodies of work are still related. Science has always been very important in my family, as has art. The interest in science coincides with an interest in social and environmental justice. When I include these shapes from nature in my art I hope to not only celebrate their beauty, but to also encourage others to appreciate the natural world around them, and hopefully work towards it’s preservation. I use painting, drawing, and printmaking to apply scientific images, and images that relate to specific memories, to delicate porcelain pieces. I use the fragility of the porcelain as a stand in for the fragility of the organisms or emotions I am representing. My work tends be composed of small-scale components used to make up a larger scale installation or freestanding sculpture. I stick to a rather muted color palette, even when I use a brilliant color like red; it is overwhelmed by the whiteness of the clay it is on. I combine three- dimensional ceramic sculpture with printmaking, bookmaking, and photography. I mainly work with cone 6 oxidation fired clays, but I use others when they suit the piece. My work is narrative; telling stories of specific problems or joys that I perceive.